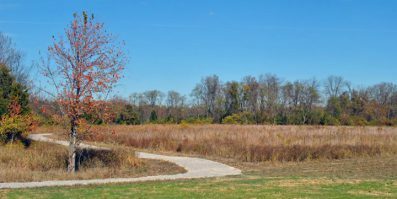 Batavia, Ohio – Want to build a rain garden, but need a little financial help? The Clermont Soil and Water Conservation District invites property owners in the county to apply for a grant to plant a rain garden. Up to 10 grants of $200 each will be awarded; assistance will be provided to teach citizens how to design and plant the garden. Rain gardens are quickly growing in popularity among homeowners as a beneficial and attractive idea for landscaping. Rain gardens are landscaped areas planted with wild flowers and native plants, such as Blazing Stars, Lobelia, and Coneflowers, that soak up rain water and filter it into the ground over a 24 to 48 hour period, instead of allowing it to run off into a storm drain or ditch. These types of environmentally friendly gardens allow about 30 percent more water to soak into the ground than a conventional lawn. Rain gardens also help remove pollutants. A substantial amount of pollution is carried into our waterways by runoff from our lawns, rooftops, driveways, parking lots, and roadways. Rain gardens capture the rain water runoff from those areas; the water is then absorbed by the rain garden plants and filtered into the ground. Rain gardens are perfect for preventing pollutants such as fertilizers, pesticides, oil, and other hazardous fluids from entering our waterways.